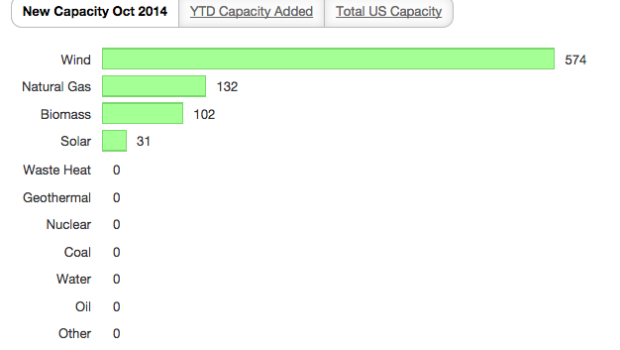 Two thirds of new US electricity generation capacity were from the wind sector in October. Five wind farms, with a cumulative capacity of 547 MW, went online. There were also 102 MW of biomass and 31 of utility-scale solar power. This is becoming a familiar picture, with renewable sources accounting for the most added generation during 8 months so far this year. The only fossil fuel making strong advances is natural gas, which had 132 MW added in October, but a dominant 5373 MW added in the first 10 months of the year. There have been no new coal plants and only limited additions in the oil and nuclear sectors. The question I have is what will happen after the Republicans take control of Congress in January? The cost of wind and solar has fallen greatly in recent years. 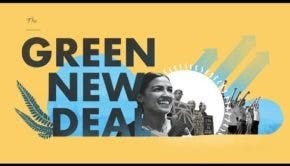 According to an article in today’s New York Times, even without subsidies, wind power is often cheaper (as low as 3.7 cents per kWh) than coal (low of 6.6 cents per kWh) or natural gas (low of 6.1 cents per kWh). Utility-scale solar was slightly more expensive (low of 7.2 cents per kWh), but costs continue to fall. With subsidies, wind has gotten down to 2.5 cents per kWh, as we’ve reported previously. These prices do not include the cost of a backup for wind and solar require, or the costs in terms of human health or rising GHG emissions from fossil fuels. The tax credit for wind comes up for renewal again at the end of this year. It amounts to 2.3 cents per kWh for 10 years. Some Republicans, who want the credit dropped, indicated they want to delay the decision until they take control of congress in January. Ironically, the self-styled “father” of the wind production credit, Charles Grassley, is a Republican, and he is not the only Republican who supports it. More than 450 businesses and organizations have written a joint letter urging Congress to act promptly to preserve the wind production tax credit. “We urge you to restore the expired clean and alternative energy technology and energy efficiency tax provisions during the post-election work period. Doing so will help build the economy, create jobs, and deliver a safer, healthier future for our children,” the letter states.